Leyburn Library is situated next to the Elrod University Commons, and directly behind the buildings forming the Colonnade. The Science Library is located next to Leyburn Library, in the Science Center. 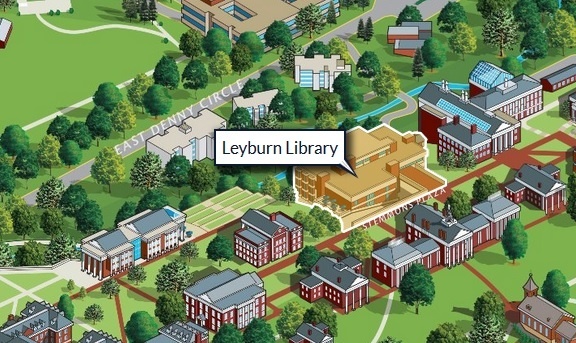 On the campus map, Leyburn Library is number 50 and the Science Library is number 73. The parking garage is on US 60 West (Nelson Street extension). Visitors should park in the spots reserved for visitor parking. Visitors with disabilities may want to cross the wooden bridge from the parking garage to the University Commons, then take the elevator to the Main Level, and proceed towards the library. If you would like assistance, please call Security at 540-458-8999.